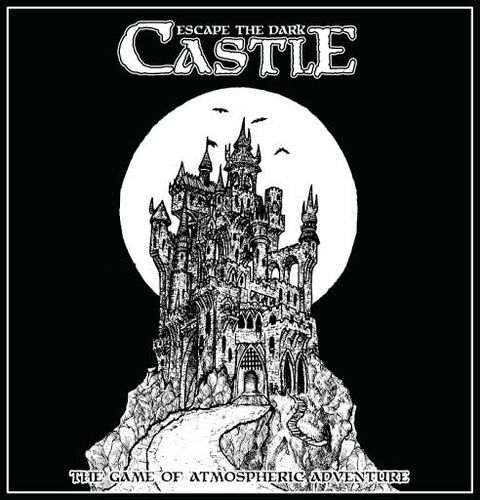 Escape the dark Castle was the game that came out a last year ago from Themeborne games with little or no fanfare. 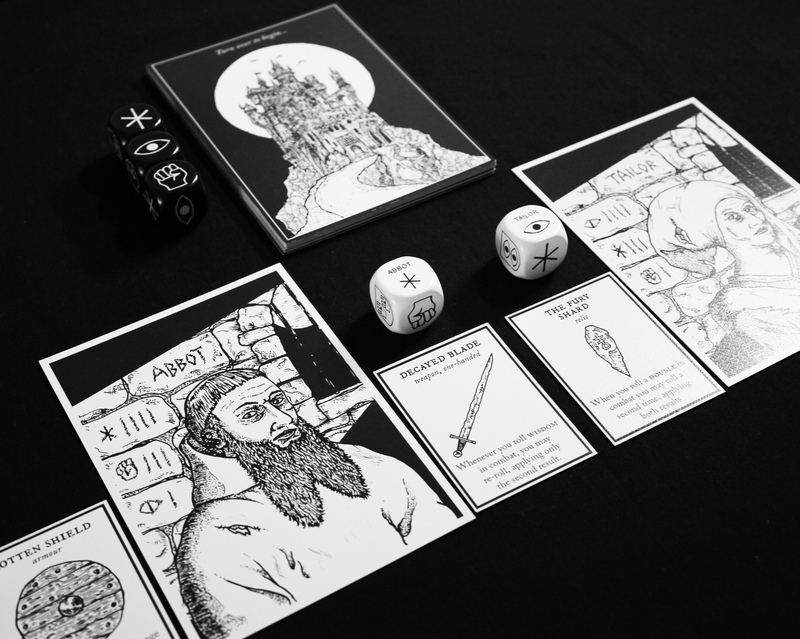 With the vast number of Kickstarter produced games now it is easy to miss any individual games of course. It is now back with a new Kickstarter (ending on 30 June 2018), so Themeborne games are building on the success of their earlier kickstarter. The game is a castle adventure game which is very easy to learn as well as easy to understand. A game can be set up extremely quickly so it’s good for newcomers to the hobby. 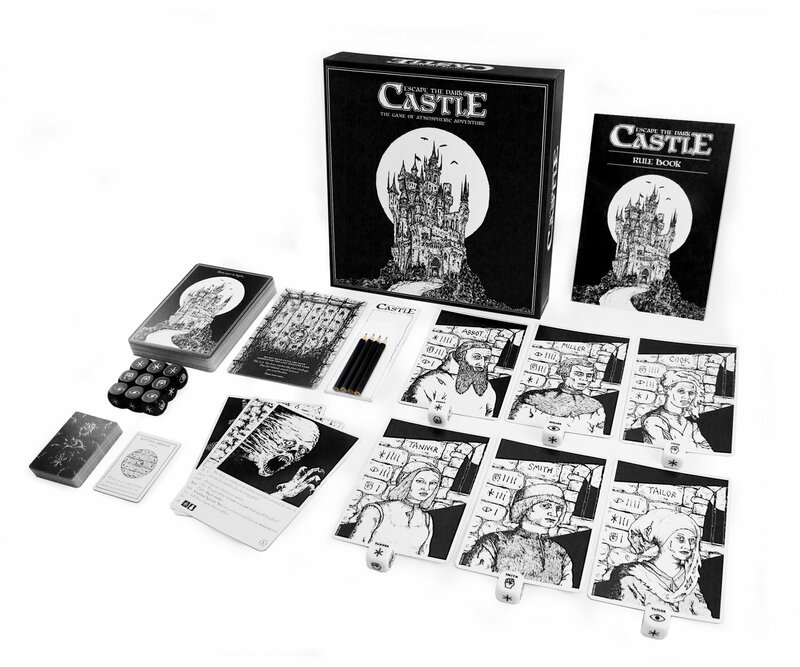 Each character represents a prisoner held in a castle cell and now looking to escape. Each has a 6 sided die with two faces showing double for one of the three skills and the rest of the sides a single skill. In total there are 8 skill points (pips) on a die and the mix is unique for each character. For example, the Smith character features 4 skill points of might, 3 of wisdom and one of cunning. All other characters follow this mix making six characters in total. It’s very easy to see how this was created and what a good idea this was. The character card shows all this simple information. Players select their characters and associated health points which are linked to character numbers used in the game The top card of the fifteen card story deck is turned over and the text is read. As the atmosphere is key to enjoying the game, this is not one of those game where you skip the text and jump to the decisions. 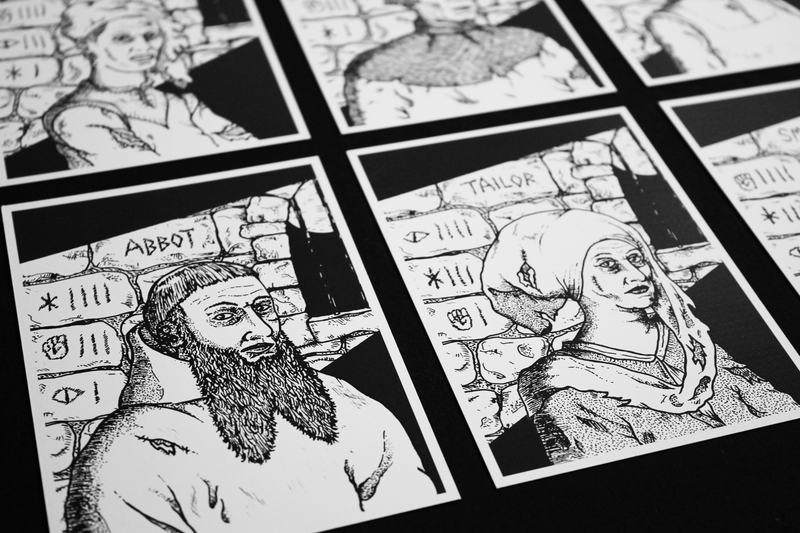 Each of the 15 cards (out of a deck of 45 chapter cards) is an individual mini story with accompanying picture. It’s probably time to talk about the artwork from Alex Crispin, which is superb for adding to the atmosphere. Every character, chapter and boss features a black and white drawing. The characters all look worn out with heavy eyes, having been incarcerated in a cell for many years. They all look wearily at the environment. If you met these people on the street you’d quickly cross to the other side of the road. However, through cooperation at least one of them might escape the prison and the castle’s many horrors. Back to the game. Each encounter requires the players to nominate a character to reveal the next chapter. Often this character will be the focus of the creature in the chapter but whether might, wisdom or cunning will be required no one knows. Many encounters require the party to fight, though some you have other options such as to flee and take health damage. Each creature that wants to fight has a number of black chapter dice that feature one of the skills and often more dice are added – one per character- which add more skills. This set of dice must be rolled by the characters to succeed in killing the creature but can be knocked off by the characters. This is where the doubles on dice help, and they also prevent damage if the creature is not killed as returning damage is applied to characters. Instead of attacking a creature a character can rest to recover one health but of course this reduces the chance of defeating the creature quickly. Player interaction is encouraged and discussion of the options helps new players and create the atmosphere. There are also items that are earned and these help with fighting and healing and you need to use the healing items as you can only carry two items per character. Once you have gone through 15 cards, the boss comes out (in the base game one of three) and either you’ll best him or lose. Either way it’s fun. I like this game a lot. It is so easy to play and enjoy. The characters are different so choosing a good mix is important and the player interaction is relevant as you decide who should reveal the next chapter. Bad dice rolls mean lower chances to succeed but the items can help mitigate some of this. The artwork is really well done and helps set the atmosphere – everything is black and white. The dice are really chunky with white character dice and black chapter dice while the chapter cards are tarot sized and well illustrated. The options for each chapter are clear and you don’t need to reference the rules, which makes a pleasant change these days. The only aspect I would have changed is to use cards, chits or cubes to record the health points instead of the pads provided, but this option is now offered in the current Kickstarter. I was a little concerned about replayability as you would soon recognize how to deal with the cards that you have met before. But the reverse has been true. Cards I’ve seen mean I am aware of what might come out in the next chapter so there is increased tension. Which really surprised me. Also, the chapter cards are not seeded, so any card could follow the previous one. This lead me to think that the escape would not feel connected as cards come out at random, but I think the artwork, simplicity of style and speed of play all overcome this. So my concerns were dismissed and I have to say I enjoyed the game even more. I’ve now played games with new players and experienced ones and the reaction has always been good, especially from new players who might be daunted by a game that doesn’t feature elements that they are familiar with. Games only lasts 30 minutes so the game length and ease of play makes it ideal for an end of evening or opening game. The game is ripe for expansions of course and there are three available via the current Kickstarter. The game pricing is reasonable and I can see this getting into many people’s collection as it widens popularity and interest.